A gypsy carnival pitched camp along an alley west of Seventh Street on tumble-weeded lots where the high school would one day stand. Curiosity took me there as I walked from Tope Elementary to my grandparents’ house on a warm autumn afternoon. Mesmerized, I watched an ear-ringed man twirl apples on sticks around a cauldron of bubbling red candy. The shiny taffy apples cooled on a marble sheet, then, upright on pin holders, tempted passersby. There were no paper wrappers, and this was not something my parents would have approved. Surely the apples hadn’t been washed, and the candy would smear all over my face and clothes. Besides, I had no dimes in my pocket, so I could only wish for a taffy apple, knowing full well there’d be a few butter mints in my grandmother’s candy drawer. Apples and sugar have come together as far back as the history of sweets. 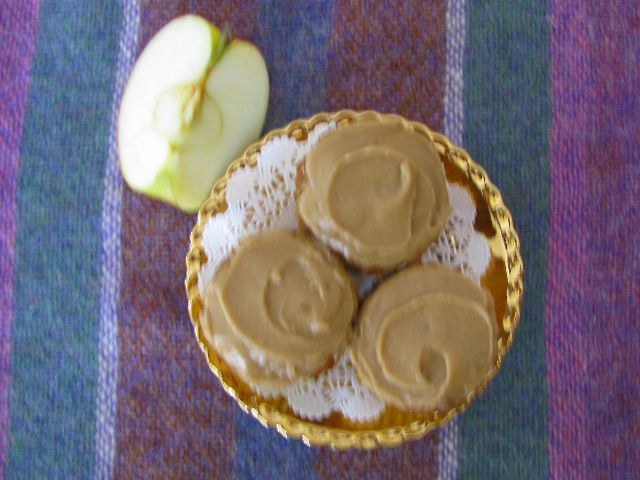 Each fall we expect traditional treats based on the season’s fresh apples. The original taffy apple morphed into the now ever-present caramel apple with a soft rather than crackling coating. Apples readily take to caramel and spices, and this sweet apple cake is always welcome in October. Decades ago Sue gave me the recipe, and Pat suggested the praline icing. It’s a great keeper but won’t last long once the taste is out. The following recipe will make a deep 8-inch layer, 16-20 regular cupcakes, or 36 minis (just right for oldsters who only want a taste and youngsters who shouldn’t have too much). Peel apples and grate on the large holes of a box grater. Measure 2 packed, generous cups. Preheat oven to 350°. In a deep bowl whisk the eggs and beat in the sugar, salt and gradually pour in the oil. Blend in cinnamon and nutmeg. Stir in the grated apples then sift over the flour and soda. Stir gently to combine thoroughly. Spoon batter into 16-20 paper-lined regular cupcake tins or into 3 dozen paper-lined mini tins. (Or bake in a parchment lined, greased and floured deep 8- or 9-inch cake tin.) Bake cupcakes 20-25 minutes or until puffed and test done. Layer cake will take 35-45 minutes. Remove from tins, cool on wire racks before topping with Praline Icing. Combine all ingredients in a small, heavy saucepan. Swirl over moderate heat to dissolve sugar. Cover and bring to a boil allowing the steam to melt any crystals off side of pan. (drip a bit of syrup on an ice cube to test). Remove from heat, drop in 1 tablespoon butter and allow to cool (may take up to half an hour). Add ½ teaspoon vanilla and beat with a wooden spoon until creamy and spreadable. If icing stiffens too much, stir in a few drops of hot water. Swirl over cupcakes and allow to set. When our family garden produced a mountain of winter squash, my mother added mop wigs, kerchief ties, nail polish–painted faces to the big Hubbards and gave them away for Christmas presents. That year of the great harvest should have filled me with squash for life, but I’m still on the lookout for any edible gourds that arrive with October apples. The butternut is now my go-to choice for sweet, meaty flesh that blends with many flavors. I cube and roast it with onions, peppers, Mexican cinnamon and olive oil; grill it in the shell and anoint it with pesto; braise it with tomatoes, garlic and a bit of bacon; simmer it in risotto; or, best of all, puree it in soup. 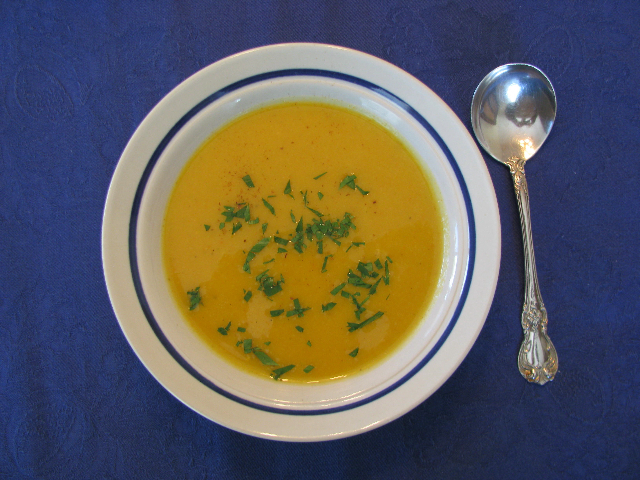 Over the years, I’ve tried dozens of winter squash soups, but I always come back to this one. The simple squash is lifted with Indian spices and mellowed with a bit of cream and butter. It takes to the zip of extra chili, but is equally welcome with just the warmth of ginger. It keeps for several days, freezes well and should be a part of every autumn. It may seem like an ordeal to peel and dice a winter squash, but squash cooked in the spicy broth reaps a generous flavor advantage over baked squash added precooked to soup base. Why not pick up a squash, sharpen your chef’s knife and get cracking! Note: garam masala is an Indian spice mixture that adds depth of flavor, but may be omitted. Or you may substitute a tiny pinch each of clove and ground cardamom plus a little extra grated nutmeg. 1. To prepare squash, cut off ends, slice into 1-inch circles. Scoop out seeds, peel off rind with paring knife, and cut squash into large cubes. Set aside. 2. Heat butter in large soup pot, add cinnamon, then toss in sliced onions, carrot, celery, chili and garlic. Cover with butter wrappers and sweat vegetables over gentle heat 10-20 minutes or until carrots are limp and tender, but not brown. 3. Add grated ginger (use microplane or Asian ginger grater), garam masala, turmeric, and stir until fragrant. Mix in prepared squash; add chicken stock, water, salt, cover and bring to a boil. Simmer steadily until squash and carrots are very tender, 15-20 minutes. 4. Cool slightly, fish out cinnamon sticks, and add cream. Puree soup 3-4 cups at a time in blender and use small ladle to swirl soup through strainer to remove celery strings and chili seeds. Correct seasonings, adding salt, pepper, sugar and freshly grated nutmeg to taste. Thin to desired consistency with water, stock or milk. Makes 2 quarts. Meat loaf was there and then it wasn’t. In the 1950s everyone had meatloaf. It became a supper standard and a way to stretch protein. Beefed out with oatmeal, bread or cracker crumbs, a pound of ground meat could serve a family of six. It morphed into meatloaf sandwiches, individual meatloaves and even gussied up with bits of ham, olives and mushrooms to become a sort of American pâté. Burgers and meatballs now have the spotlight, but meatloaf’s an easy answer to the “what’s for dinner” question. With basic ingredients available at every supermarket, ten minutes to chop and mix plus an aromatic bake while you prepare a salad and blanch broccoli, meatloaf still makes a good dinner. * To make fresh breadcrumbs, remove crust and dice bread. Drop into a whizzing blender to crumb or crumble with fingertips. Soak breadcrumbs in milk. Sauté onion until softened; cool. One key to a light meatloaf is to mix gently. Break the meat apart with a fork, and mix in ingredients with a forking motion rather than kneading. Combine everything except ketchup and bacon. Shape into an oval loaf 7 by 3 inches and place in a flat glass or pottery baking dish. Cover the top and sides with ketchup and lay over a strip of bacon. For added flavor, surround the loaf with thinly sliced onion. Large dice of 5-minute parboiled potato will bake nicely along with the meat loaf. Place in a cold oven, set temperature for 375° and bake for about 45 minutes or until the loaf reaches an internal temperature of 160°. Serves 2–3. Recipe may easily be doubled for a larger loaf needing 15 minutes longer to bake. 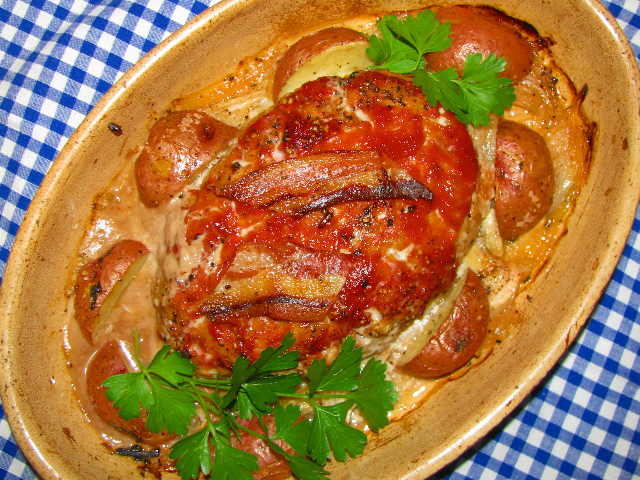 You are currently browsing the Mary Jo's Kitchen blog archives for October, 2010.